What was your New Year’s Resolution? If you’re like many Americans, it may relate to weight loss or general health and wellness. In fact, Statistic Brain reports a study conducted by the University of Scranton, which identified this year’s top resolutions, and 38% fell into this category. The full top 10 list for 2014 is below. Did your resolution make the list? More importantly, have you remained vigilant in your quest to achieve your resolution, or have you already fallen off of the bandwagon? According to the same study, 45% of Americans usually make New Year’s Resolutions. Of that group, 64% remain committed after one month (aka. February), but that number drops to 46% after six months (aka. July). Where do you fall in these statistics? What more can you do now to maintain your resolution and ensure your commitment to health and wellness in 2014? Below, we identify a few tips to help you set yourself up for success with an attainable resolution, as well as a printable calendar to keep track of your progress throughout the year. You already balance a busy life, full of responsibilities and multiple priorities. If you tackle too much at once, you may bite off more than you can chew. Here are a few tips on how you can reign in your resolution, and design a manageable plan. Select the main area of your life you’d like to see change. Examples may include: Lose weight, more sleep, increase personal wellness, or improve fitness. Keep it simple and specific, and focus on 1-2 priority goals for advancement. Examples may include: Lose 10 pounds per month, incorporate at least five servings of fruits and vegetables into your daily diet, exercise 30 minutes a day, 5 days a week, or go to sleep by 10:00pm each night. What tactical items will help you celebrate success in this coming December? Create a plan that includes realistic, daily to-dos. 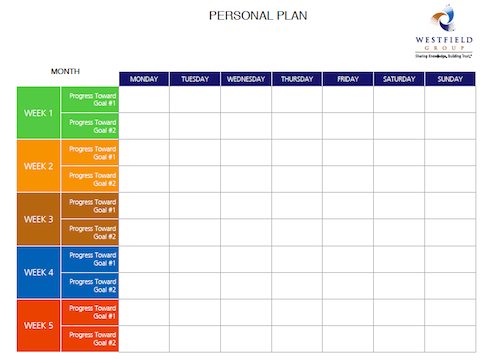 Map out your plan on a calendar to help organize your plan, and enable you to track your progress. Examples may include: Total weight loss goal, number of miles run, lower cholesterol, or evidence of diet awareness and a shift toward making healthier choices more naturally. Note what you grab and gravitate toward at the start and end of the year. Select a personal reward to acknowledge your success. Give yourself incentives and recognition by selecting a personal reward/ treat if you hit your monthly, quarterly, or end-of-year goal. Examples may include: Take yourself out for a nice meal, plan a celebration with friends, or splurge on an item you’ve always wanted. Make progress each day to make goals manageable and less overwhelming, and track your success. Track your progress toward your overall goal, the challenges you face and your big wins. This will help you remember what it took to succeed, and enable you to evolve your plan throughout the year and into 2015. Map out your personal plan for success today!